Duke Special is returning to Ireland in 2016 in a series of solo shows covering much of the country throughout January, February, March & April. Many people are aware of Duke’s platinum album ‘Songs From The Deep Forest’, and the hit song ‘Freewheel’, but many may be surprised by the cultural breadth of his other work. His creative talents have seen him involved in projects as diverse as writing the theme tune for the Irish Sesame Street to writing the music for and appearing in Deborah Warner’s critically acclaimed 2009 production of Bertolt Brecht’s ‘Mother Courage and Her Children’ at London’s National Theatre. He has presented a documentary on the life of ’50s megastar Ruby Murray, has been commissioned by the Metropolitan Museum of Art in New York to write a series of original songs based on photographs for their exhibition of the photographers Stieglitz, Steichen, and Strand. He has performed with orchestras such as the Ulster and RTE Concert orchestras and has finished an unfinished musical by Kurt Weill based on Huckleberry Finn. Recently he joined forces with stand-up comedian Andrew Doyle and together they brought a brand new musical adaptation of Gulliver’s Travels to the Lyric Theatre in his native Belfast, a production created by the team behind the West End smash hit Once the Musical! 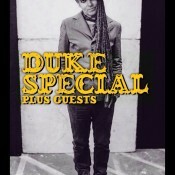 Always looking for new and interesting collaborations and projects to get his teeth into, Duke Special really is an artist who never stops!